Home > News > Planet Trump > Did Scott Pruitt Lie to the Senate? At a panel discussion this week that Sen. Tom Carper of Delaware, the committee’s highest-ranking Democrat, convened to seek further information on Scott Pruitt’s record and positions, some members began to wonder if Pruitt told the truth during his earlier confirmation hearing. It’s a good question. Compare these examples of what Pruitt said in sworn testimony to what the record actually shows. Limited role for Oklahoma attorney general? At his confirmation hearing, Pruitt testified: “Our state has not provided constitutionally as much authority as other states” to bring actions against polluters. He claimed that instead his job was to provide “guidance” to state environmental agencies. In fact, Pruitt had broad authority and duties under Oklahoma law to prosecute polluters. Pruitt claims environmental enforcement didn’t stop after he disbanded the attorney general’s environmental protection unit. 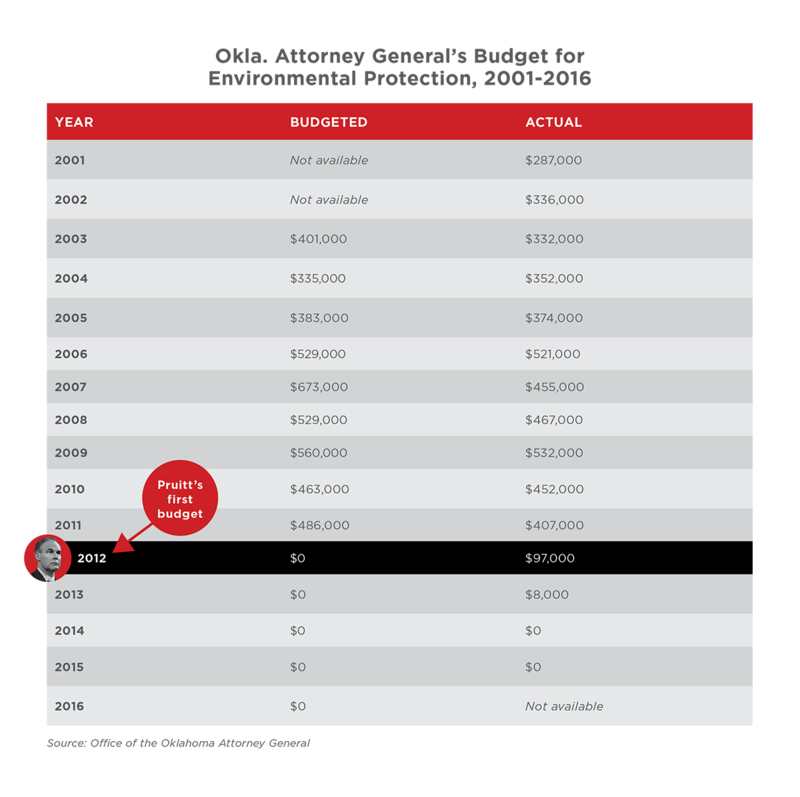 But budgets show that after taking office Pruitt cut allocations for “environmental law” to zero. What’s more, nearly all of the environmental actions cited by Pruitt were actually started by his predecessor, Drew Edmondson. Edmondson investigated and initiated dozens of actions on agricultural pollution, contaminated former industrial sites and dirty groundwater. Edmondson also helped form the Oklahoma Environmental Crimes Task Force, which conducted 142 criminal investigations resulting in 56 prosecutions. Prosecuting oil and gas polluters? Pruitt repeatedly claimed during his testimony that he took action against oil and gas companies, such as ConocoPhillips. The case he cited was not an environmental case, but a fraud lawsuit against ConocoPhillips – the company allegedly committed fraud by double-collecting remediation funds. What’s more, he dropped two similar cases against Chevron and BP. Meanwhile, Pruitt did nothing to address pollution from the ConocoPhillips refinery in Ponca City, Okla., which was given the nation’s highest hazard rating for benzene, a known carcinogen. Pruitt claimed that a 2013 agreement between Oklahoma and Arkansas was historic because Arkansas would be required for the first time to meet Oklahoma’s water quality standard for phosphorus in the Illinois River. But that’s not true: Arkansas has been required to meet Oklahoma’s standard since 2003. In fact, the 2013 agreement actually amended an earlier agreement by giving give polluters more time to clean up the river. In 2005, Edmondson sued poultry polluters for dumping more than 300,000 tons of chicken manure into the Illinois River, but the case was not decided by the time he left office. Pruitt claimed that he “[filed] briefs in support of the court making a decision” in the case after taking office. But the court docket shows that he did not take any action to encourage the judge to hold the polluters accountable. Pruitt claimed to “have not reviewed, nor know about” whether there is any safe level of exposure to lead, particularly for children. But an agreement reached by Pruitt to clean up pollution from a smelter in Blackwell, Okla. – included in the list of environmental “accomplishments” he gave the committee – was actually weaker than the agreement reached by private attorneys. What’s more, Pruitt’s lead standard was also weaker than federal standards. In his testimony, Pruitt denied he had said the EPA should not regulate mercury emissions. But in legal filings, Pruitt has twice argued that the EPA was breaking the law by regulating mercury and other toxic air emissions. So did the man who may be placed in charge of the EPA lie to a Senate committee? The only way to know would be to hold a second hearing on his nomination.